Naturally, as I approach the idea of gardening I approach it with the idea of it being some kind of wonderful family activity in which everyone will be excited about weeding (or something.) Gryphon House had some interesting books related to gardening and the great outdoors that I thought I'd check out for my wee ones this gardening season. It is my great hope that my children will love gardening. I don't know why I hope this. When my dad attempted a garden when I was growing up, I don't recall loving it. I recall boredom. But maybe my children will surprise me and surpass my expectations? As I said, I took a peek at The Budding Gardener for starters. This is a book filled with ideas for hands-on activities to bring children into the wonderful world of gardening. "No matter where or how you begin, gardening cultivates observation, patience, and responsibility, and offers rewards beyond measure." I actually started flipping through The Budding Gardener last fall (this review is long delayed) and it got me to start thinking about how I could engage my children in this Family Project. For starters, I asked Bookworm1 what kinds of food he thought would be fun to grow. (There is an idea in this book for how you can create a "Pizza Garden" that I thought was quite brilliant!) He told me that he thought we should grow watermelons (in bright sunny Oregon!) and sunflowers. I'm not feeling too sure about the watermelons, but we bought some sunflower seeds which I'm hoping will produce for him. He also selected snap peas and we've been growing those (successfully!) on our deck in Earth Boxes. We are all budding gardeners and this particular book helped me to see that this was possible. In Learn Every Day About Seasons Charner provides us with ideas for seasonally appropriate crafts, activities, songs and finger poems. There are book suggestions to go along with the activities and lists of materials needed in order to work on any particular craft. 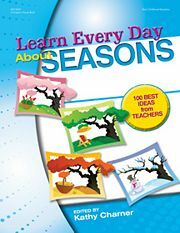 If you are just getting into the basics of the four seasons with your little one, this book might be one to check out! How are we practically applying information about seasons? Well, we've started our own gardening calendar so that we can take note of what we planted where and when and so that next year we'll remember when rhubarb is supposed to start making its appearance. What a joy to have activities planned together! I love the idea of gardening together, I just have no idea where to start. The only plants I haven't killed are my geraniums. But who knows? I might be a vegetable gardener! We tried growing tomatoes in pots a few years ago. The boys kept pulling the green tomatoes off just before they were ripe. Little stinkers. My friend, Amy, has planted a "Salsa Garden." Tomatoes, peppers and cilantro. All the ingredients you need for your own fresh salsa. 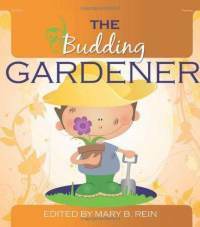 The Budding Gardener looks really cute! It's definitely going on my list for next year. I think(hope) Grasshopper will be more ready for something like that by then.